Product prices and availability are accurate as of 2019-04-24 06:57:49 EDT and are subject to change. Any price and availability information displayed on http://www.amazon.com/ at the time of purchase will apply to the purchase of this product. 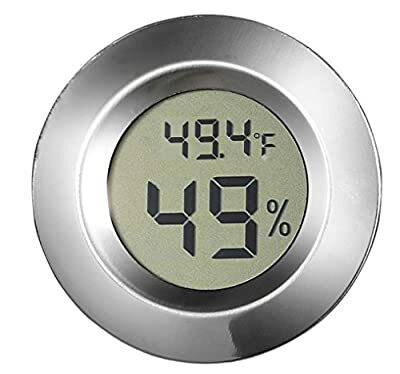 Digital Hygrometer with Precise Readout; Shows Digital Temperature; Included Magnetic Plate with Adhesive; Battery Included (LR-44 1.5 V Alkaline Button Cell Battery; Approx. Dimensions: 1.75 inches (Diameter with Face) x 1.55 inches (Back Diameter) x 0.55 inches (Thickness); Approx. 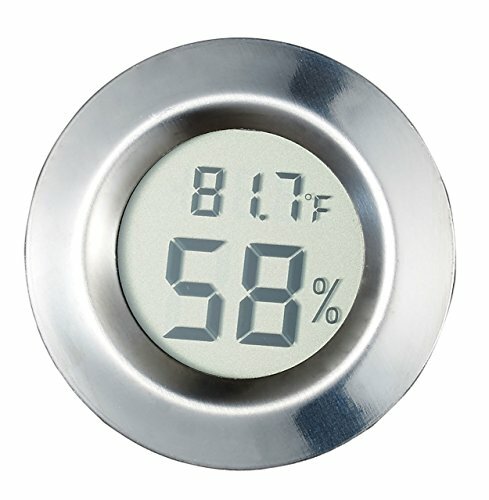 Weight: 0.04 pounds Made with Plastic; Battery can be Easily Changed; Can be also inserted in Travel or Desk Humidor with Circular Slot (Check Dimensions for Accuracy) Comes Packaged in Cardboard Box; Comes with Detailed Instructions Manufacturer Updated This Product to Show Temperature in Fahrenheit.